Clear Climate Code is a timely project to reimplement the software of climate science academics in nicely structured and commented Python. David Jones has been using ScraperWiki views to find out which areas of the world they don’t have much surface temperature data for, so they can look for more sources. Take a look at his scraper Canada Climate Sources. If you scroll down, there’s a section “Views using this data from this scraper”. That’s where you can make new views – small pieces of code that output the data the way you want. Think of them as little CGI scripts you can edit in your browser. This is a screenshot of the Canada Weather Station Map view. It’s a basic Google Map, made for you from a template when you choose “create new view”. But David then edited it, to add conditional code to change the colours and letters on the pins according to the status of the stations. 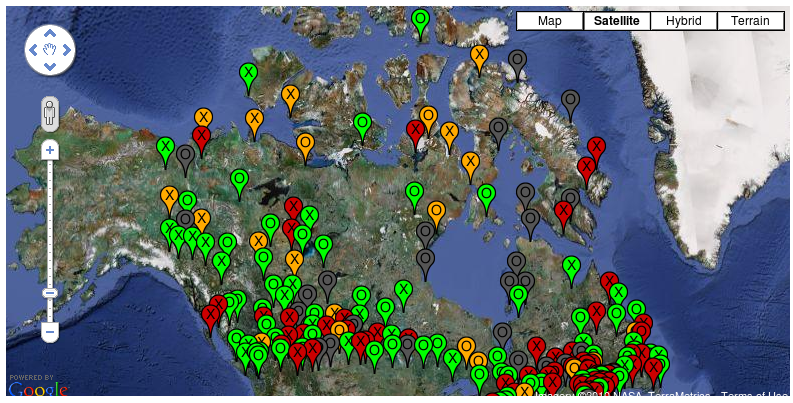 There’s more about ScraperWiki and the Canada weather stations in the posts Canada and Analysis of Canada Data on the Clear Climate Code blog. Next week – part 2 will be about how to use views to output your data in the machine readable format that you want.